The Okavango Panhandle is where the Okavango River is channeled between two steep banks before meeting underlying faultiness which cause it to spread out and form the Okavango Delta. 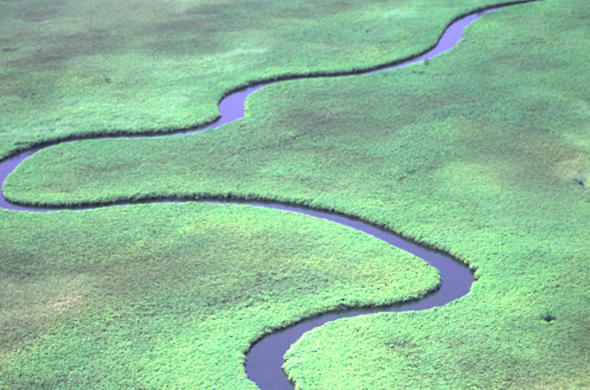 This narrow river suddenly spreading to form the Okavango Delta looks a bit like the handle of a frying pan from which the area gets it name. The main attractions of the Panhandle is taking a few lazy days on a house-boat up the river, the excellent fishing and great birding opportunities. Game viewing is not the main focus here... there is not much wildlife to speak of. Many people drive across to the Panhandle from Namibia. The western banks of the river can be reached in a 4x4 vehicle and the road is tarred up until Shakawe. You can cross the Okavango on the ferry and reach the road on the eastern side. The other route is a long drive from Maun. The River is constrained within its banks which are about 2km apart. There is a floodplain 10km across that the Okavango River meanders through in great S-bends, forming Ox bow lakes. The channels are deep and fast flowing. They are edged by thick banks of Papyrus which is home to several species of birds. Away from the river area is made up of Kalahari scrubland. This is the first area that the flood waters reach and the water level in the river can fluctuate greatly. In the low season large sand banks appear. These are the favorite sunning spots of Crocodiles. African Skimmers also use these banks to nest. There is not much in the way of wildlife in the region. The Papyrus banks are home to Sitatunga, but they are rarely seen. The region is home to many Hippopotamus and Crocodile. Birding in this area can be difficult as the Papyrus reeds are so thick. However if you have patience you will see many different species, including Painted Snipes, Rufus Bellied Herons, Lesser Jacanas, Chirping Cisticolas and Swamp BouBous among others. This is a good area to see White Backed Ducks and Red Winged Pratincoles. Migrant species such as Carmine Bee-Eaters gather to nest in the dry banks of the Okavango in the dry low season. Fish Eagles are commonly seen are Marsh Harriers. This area is known for its budget accommodation and campsites. 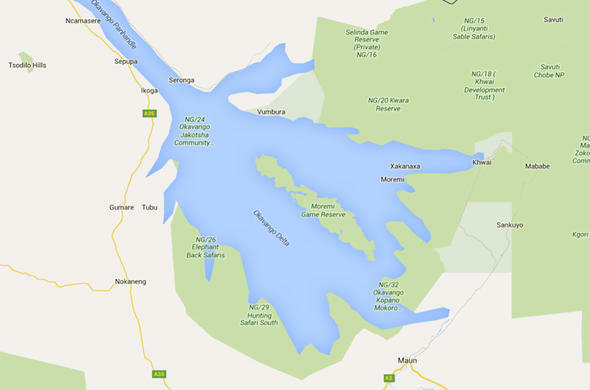 Many people go on houseboat and fishing trips in the Panhandle region of the Okavango River.